Jeffrey M. Fried, FACHE, President & CEO, Beebe Medical Center, Connie Bushey, Director, Margaret H. Rollins School of Nursing at Beebe Medical Center, Paul H. Mylander, Chairman, Board of Directors, Beebe Medical Foundation with the new Nursing Education Campaign sign in front of Beebe Medical Center. Beebe Medical Foundation has less than $785,000 left to raise to meet its fundraising goal of $8 million for the Nursing Education Campaign. The campaign is raising funds to expand the Margaret H. Rollins School of Nursing at Beebe Medical Center. Today, the school is housed in an antiquated building with space to enroll a maximum of 30 students each year. The expanded school will allow the number of enrolled students to double to 60, and it will allow the latest in educational technologies such as patient simulators. Construction plans include demolishing an existing 48-year-old, 2-story dormitory building and replacing it with a 3-story, 18,000-square-foot-building that will house modern classrooms and clinical laboratories. The main school building and its faculty offices and library will be renovated. Seminar rooms will be added and the library will be renovated and updated. The latest in educational technologies, such as human patient simulators programmed to express vital signs and responses to interventions and treatments, will be installed. Construction is expected to start later this year. The Nursing Education Campaign, chaired by Foundation Board Member Alex Pires is still accepting contributions to complete the $8 million goal. You can support this goal by sending your donation to Beebe Medical Foundation at 902 Savannah Road, Lewes, DE, 19958, or by calling the office at 302-644-2900. In June 2011, the Beebe Medical Center Board of Directors agreed to rename the school of nursing in honor of Margaret H. Rollins, a Lewes native now residing in Atlanta, Georgia. Randall and Margaret Rollins gave a $3 million gift to the school through their Ma-Ran Foundation. This gift, the largest ever received by the Foundation, allowed the Medical Center to proceed with construction plans in a single phase instead of the original two plan phase and therefore save over $1 million in construction costs. The Margaret H. Rollins School of Nursing at Beebe Medical Center is the only hospital-based nursing program in Delaware, and is accredited by the National League for Nursing Accrediting Commission (NLNAC). Its graduate nurses consistently earn some of the highest pass rates in Delaware on the nursing licensure exams. Through an affiliation with Wilmington University and the University of Delaware, Margaret H. Rollins School of Nursing offers students the opportunity to pursue a bachelor’s and/or a master’s degree in nursing. There are also affiliations with other universities. 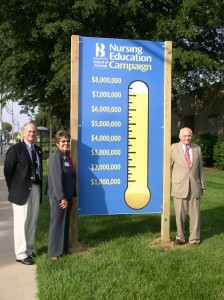 Photo Caption: Jeffrey M. Fried, FACHE, President & CEO, Beebe Medical Center, Connie Bushey, Director, Margaret H. Rollins School of Nursing at Beebe Medical Center, Paul H. Mylander, Chairman, Board of Directors, Beebe Medical Foundation with the new Nursing Education Campaign sign in front of Beebe Medical Center. Beebe Medical Foundation was established in 1989 with the sole mission to raise philanthropic support for Beebe Medical Center. The Foundation is located at 902 Savannah Road, Lewes DE 19958. For more information, please call (302) 644-2900 or visit www.beebefoundation.org.